Look who I found located front and center in the nail section at the Swiss Beauty Forum in Zurich...the Swiss Hand & Nail Harmony team from Hodel Nail Beauty. 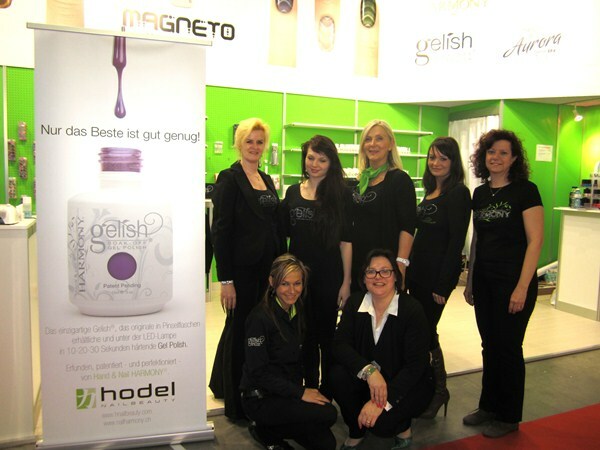 The exclusive distributor of all Hand & Nail Harmony products in Switzerland, Hodel is a family company headed up by Verena Hodel. It truly was a family affair; Hodel's son and two daughters were helping out in the booth. Back row from left are Julie Grossenbacher, Linda Hodel, Jannike Grand, Nadia Hodel, Yvonne Notario. Front row from left are Sofie Devlieger and Verena Hodel (who was also a judge for the nail competitions...I actually met her on stage presenting the awards for sculptured nails and tip and overlay).